Information: This enhanced Landsat Thematic Mapper image shows an area roughly 140 kilometers wide situated on the edge of the Empty Quarter in the country of Oman. This satellite data shows the infrared portion of the electromagnetic spectrum. 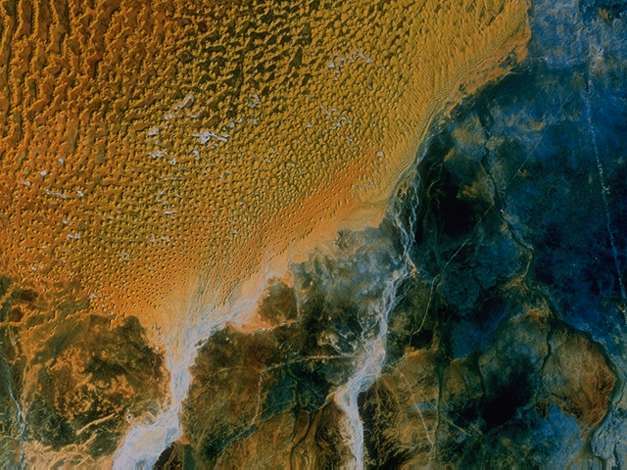 The northwestern part of the image is dominated by sand dunes. There are two major wadis (dry river beds) flowing northward into the dunes. The desert floor, mostly rocky gravel plain and exposed limestone bedrock, dominates the southern and eastern portions of the image. The obvious light colored roads are modern gravel roads. There is a triangular intersection of modern roads just east of the longer wadi. The triangle of roads goes around the modern village of Shisr, which is located at the probable site of the ancient city of Ubar. Careful examination of the area east of shisr will show several converging faint tracks. While still occasionally used, archaeological investigation indicates these roads are in fact ancient caravan trails.